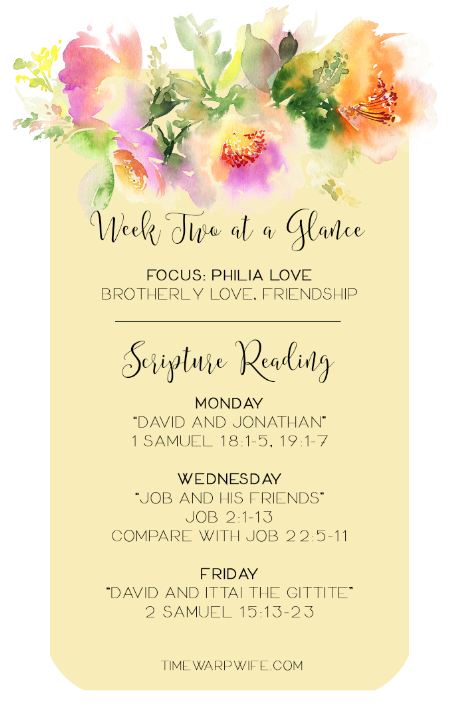 This is week two in our Bible study, “Learning to Love.” This week we’re taking a closer look at the Greek word “Philia” – brotherly love, friendship. If you’d like to join our study, click here to find the free Bible study guide and all of the information you’ll need to join in. Q. Some people have asked where they should sign up. A. I don’t have sign ups for this study. I share my thoughts in our Bible Journaling group on Facebook almost every day, and I also post here on the blog on Mondays and Fridays. If you would like to subscribe to receive my posts in your inbox, you can find the widget in the sidebar–just look for the blue mailbox. If you have any trouble with the form, email me at darlene@darleneschacht. net (no spaces) and I’ll subscribe you manually. Q. Do we record our thoughts in the Quieting Your Heart Journal or the study guide? A. I prefer to keep mine all in one book, so I record everything in my Quieting Your Heart journal. Some people don’t have the journal, so they use the study guide and a separate prayer journal on the side. You can do it either way. Note: Some of the first copies of the study guide I put out said something like “Philia – Week 4,” but don’t let that confuse you–we are indeed on week 2. One of the beautiful things about the bond of friendship is that it gives us an opportunity to sharpen each other in love. We see this in scripture where Jesus gently corrected Martha (Luke 10:41), and another instance where He sternly corrected Peter (Matthew 16:23). It’s been said that “people don’t care what you know until they know that you care.” Since friendship is built by two caring people, it gives us that opportunity to grow and to heal as we share each other’s burdens. One of the most beautiful things two people can do is to study the Bible together. It always warms my heart when I hear about moms getting together to read the Bible or men getting together to pray. Church gives us an opportunity to do this, but friendships within the church even more so. 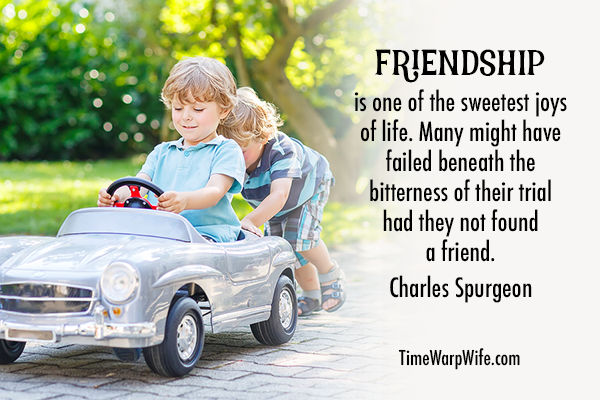 While we must be friendly to all, it’s important to have close friends that we know will strengthen us spiritually. A good friend won’t tickle your ear with flattering words. They’ll have your best interest at heart. Good friends will pray with you, they’ll encourage you, and they’ll share truth with you when you need to hear it the most. If you don’t have outside friendships, don’t lose heart. You’re not alone in this–some have them, and some don’t. It’s interesting to note that most people treat their friends more politely than they do their own family members. When you’re friendly to someone you give them your full attention. They get eye contact. You’re on your best behavior. You make an effort to be kind, to smile, and to give them your best when you’re with them. You might put on your best outfit when you go out for lunch. You might laugh at all of their jokes, and treat them with the utmost respect. Manners are in check as well as your tongue. That’s a good thing, but let’s examine our hearts to ensure that we’re being friendly to our family as well. Both times the word love appears in that verse, we find a compound word prefixed with philos. (philandros and philoteknos). What that says to me is that we need to be friendly behind closed doors. Take the opportunity to cultivate friendships within the relationships you already have. For example, you can be friendly to your mother-in-law, the person next door, your husband, your children, and the people at church. P.S. The printables are a little bit different this week than they were last week. 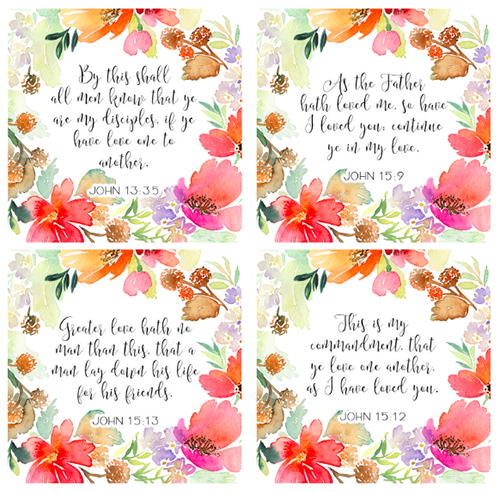 Instead of a list of Bible verses, I wanted to provide you with printable scripture cards. I’ve included the ones we had last week, so you can have a complete set. I also decided to bring back the “Week-at-a-Glance” sheet, which you’ll find below. 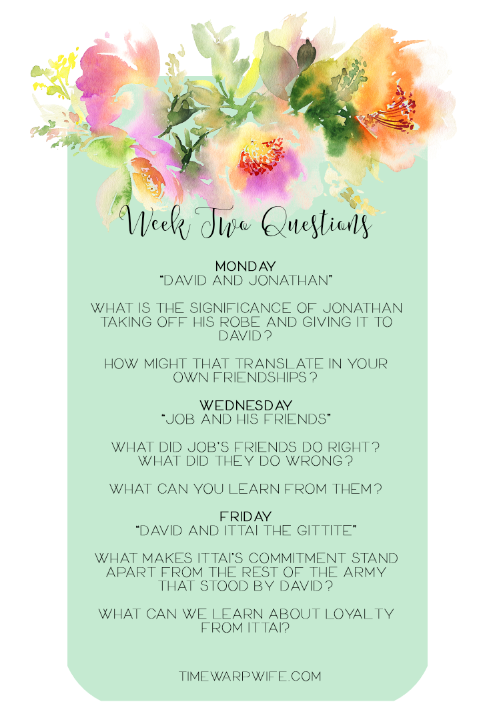 Click here to download and print this week’s questions. This can be printed out, and kept in your Bible for quick reference during the week. These printable scripture cards can be kept close through the week. They give us a love related verse to meditate on throughout the day. Come back next Monday for 7 more cards and the following Monday to complete the set of 28 cards. Coloring pages are good for relaxation. I hope you enjoy this one! Thank you! I am having a hard time with the week at a glance link, though… 404 Page Not Found message. I LOVE the design for the scripture cards! I just fixed the link. The photo was linked, but the text link was broken. Sorry! Thank you for the scripture cards💜 I was sad last week when there were not any scripture cards. I, too, received the “404 Page Not Found” message. So, I clicked on the picture of “week at a glance” and it came up so I could print it. The verse cards are beautiful, thank you ! I wonder if you could try another browser or maybe the server was busy? It’s working for me now. I’ll get someone else to check it too. I LOVE that you brought back the scripture cards & ALL that you do for these studies AND the fact that you make them FREE! They are such a blessing. I was curious to know if there is a way to print them without them colored. It’s killing me with printer cartridges. I LOVE the design & if I’m just using as a pdf on computer it’s gorgeous, but when I print them out, due to old printer, yeah, not so much, lol…. Thank you for your hard work & dedication to the Lord! Keep up the amazing work. Have a blessed day! It should be in your printer settings. I think most printers give you the choice. I might be wrong? Starting off our new school year here in NZ with love. Yes, even with boys at the study table and they are all coloring in. Also used the valentine card prints. ( the prints are beautiful) to sent love to family. Now we are ready for week two. What a beautiful layout this week…Love the printouts. The most awesome thing about this week’s study is that it lines up exactly with another online study I am doing over on Proverbs 31 ministry. John 13:34 – ” A new command I give you: love one another.” They are also studying about friendships all week. How awesome is that ! Thanks for teaching this study 🙂 I “love” it. That’s perfect. 😀 I love P31 ministries! Thanks! 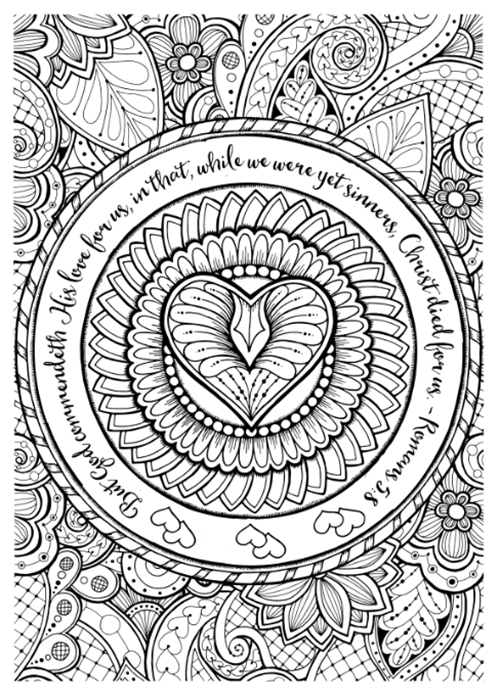 I’m really enjoying this study and it is fun to have coloring pages and the scripture verse sheets. I actually like having all of the verses on one page and it was a little less ink the way that you did it last wee, but these are prettier. Loving this study and learning so much! Thank you for sharing and for your encouragement and prayers. Can you please include a week 1 at a glance?? It would be nice to have that for week 1 since all the other weeks have them :). How do I find past posting for study cards and necessary items to utilize. I am a late starter with your program and would like to complete this on. I am trying to print Page 2 of week 1 of the Scripture cards and there seems to be an error on the text. I appreciate the free coloring page and would love to give your page a bridge link for my own traffic. Thank You and God bless your ministry! Are we allowed to share the coloring pages from your posts?